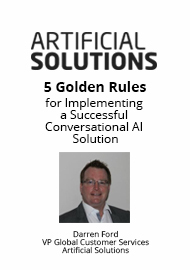 Join Darren Ford, VP Global Customer Services of Artificial Solutions to discover the golden rules for implementing a successful Conversational AI solution. Fill out the form to gain access to this content. Teneo is a Registered Trademark of Artificial Solutions; Copyright 2019 | All Rights Reserved.